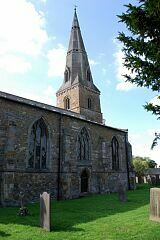 Late C13th ironstone church with a broach spire of c.C14th. 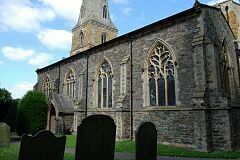 It was restored during the Victorian period. 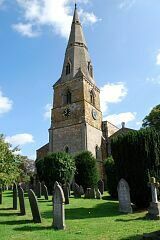 Parish church. 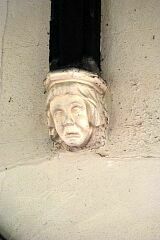 Mainly late C13, with some conservative Victorian restoration work. Mainly ironstone but some use of granite in the C19 work. West tower and spire, nave with 2 aisles and clerestory, chancel. Tall tower of 4 stages, the second is ashlar, and a different type of stone. Slight angle buttresses. 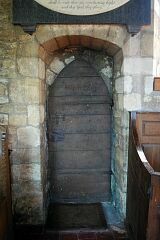 West doorway with paired shafts and hood mould. Single light with shafts in second stage, paired traceried many-shafted lights with quatrefoils to bell chamber in top stage. 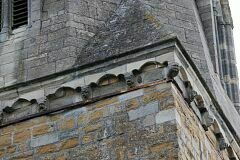 Parapet frieze with grotesque masks etc. Tall broach spire (C14) with paired foiled lucarnes and 2 quatrefoil frieze bands. South aisle is a C19 restoration, renewing existing features, and built of granite rubble with limestone sill course and window tracery. The tracery of the 3 principal windows and the one above the south doorway represent a fine collection of Decorated tracery forms. 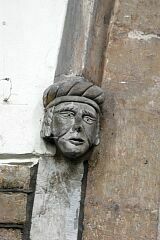 Frieze with geometric masks at eaves level. 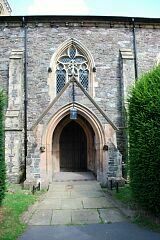 South door in coped gabled porch, the archway a continuous moulded shaft, no capitals. Aisle is wide and has a pitched roof with coped gables. Clerestory is ironstone rubble with some white ashlar work, and with 3-light windows. 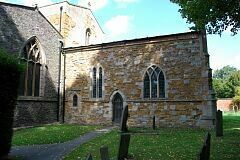 Chancel is earlier in the C13 than the rest of the fabric and is built of small ironstone rubble. North and south sides are identically arranges, with small shuttered low side window to west, then paired lancets, a small doorway, and a Y-traceried window. East window also has Y-tracery and is rather narrow. Victorian granite vestry to north. Moulded stone eaves cornice and heightening in brick. Angle buttresses to the south-east with Victorian pinnacle. 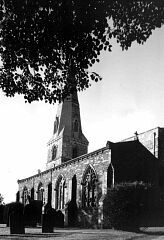 North aisle is buttressed ironstone rubble or cobble stone. 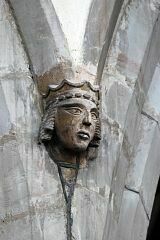 Its east window has five foiled lancets and a segment of circle cutting them, in a squared head with stilted hood mould. Was this the original design or has the window been subsequently cut through? There is some evidence that the roof pitch of the aisle may have been changed. Of the north windows, each is of a different and ornate Decorated design, the easternmost, for instance, has three foiled lancets with 2 quatrefoiled squares above. Sill course forms hood mould to north doorway. 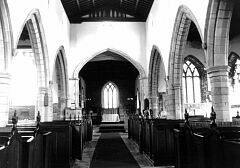 Inside, the church gives the impression of great space; both the aisles and the chancel are rather wide, and the structure is also high. 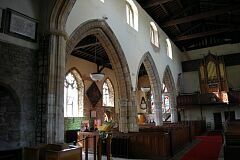 Nave of 4 bays, a late C13 arcade of triple chamfered arched on octagonal piers. Roof is perhaps C15 - tie-beams with tracery panels above, low-pitched. C18 gallery to west on slim wooden columns and with elegant cantilevered staircase. It contains a gothic organ case of 1899 and over it is a narrow musicians' gallery. Wide Perpendicular chancel arch forming a shallow curve, with traces of painted decoration on the mouldings. 2-light traceried window above the chancel arch. 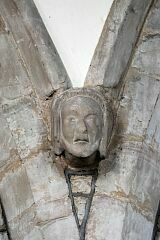 Project Gargoyle survey work in 2011 recorded a varied collection of mostly human heads from the 13th century and later, including the 19th century restoration. 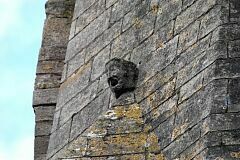 There are wooden corbels, with human heads, said by Pevsner to be late 13th century (although this seems exceptionally early for surviving wooden features and needs to be checked). 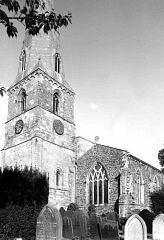 <1> Pevsner N, 1984, The Buildings of England Leicestershire and Rutland, p89-90 (Bibliographic reference). SLE4. "ST MARY. Built of ironstone. Essentially late C13 and displaying a variety of curious tracery patterns, some, it seems, unique. C13 certainly the pairs of lancet windows N and S in the chancel and the 'low-side' windows also N and S. In addition, two intersected windows. Also late C13 the N aisle window, a group of three, of which the middle one goes less far down so as to allow space for the doorway. The doorway is single-chamfered. The window above has Geometrical tracery with three unfoiled circles, the windows left and right three stepped lancet lights. The N chapel is hard to date. The E window of five cusped lancet lights under a straight head has a curve coming down to cut through the middle light - an extremely odd idea, perhaps indicating that a steeper roof pitch was planned and not completed, or that a steeper roof pitch has been reduced. Equally odd the NE window, with two pointed-quatrefoiled squares side by side in the head. On the S side more windows of the same rich style, but comparison with the view in Nichols suggests that they are all C19. The W tower could have been complete by 1300. Refaced ground floor with W doorway with two orders of shafts and shafted windows above. Bell-openings of two lights with a pointed quatrefoil in the spandrel. 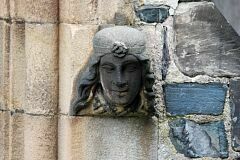 Top corbel-table with rounded trefoil frieze and head corbels. Only the broach-spire is of the C14. One tier of two-light dormers with a reticulated motif. Then two bands of quatrefoil in squares. "Inside, the E bay of each arcade is separated from the others by a short stretch of walling which may indicate former transepts. They are also wider than the others and have different details. Tall arcades of c.1300, with standard octagonal piers and capitals and double-chamfered arches. 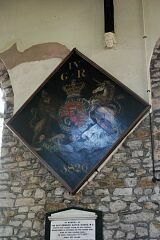 The chancel arch was removed in 1965, revealing a wider, four-centred arch with traces of painted chevrons. Low down, the jambs incorporate the remains of an integral dwarf stone screen. - SEATS. Interesting pre-Ecclesiological seating of 1837-8. Tall plain bench ends with cast-iron poppyheads and doors. - GALLERY. Now used for an organ, but retaining its original benches and banisters. Also an upper gallery formerly for the musicians. - STAINED GLASS. E window 1828. 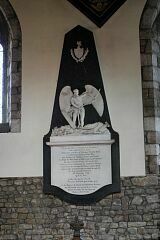 - S aisle W signed and dated by Holland of Warwick, 1858. - MONUMENTS. By Rysbrack, Charlotte Pochin d.1732. No figures. Inscription tablet flanked by volutes. 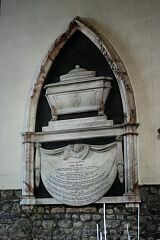 Top with short arms of an open scrolly pediment left and right of the big base of an urn. Fine detail. - Mary Pochin d.1804. Sarcophagus under a Gothick arch on which ivy grows - a romantic thought." 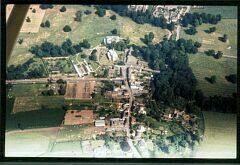 <2> Sites and Monuments Record, Parish File, 60NW BF (Unpublished document). SLE320. 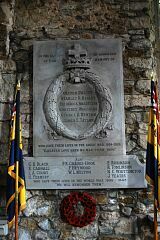 In 2004, The Barkby Local History Group produced a complete list of the interior monuments and memorial slabs within the Church. <1> Bibliographic reference: Pevsner N. 1984. The Buildings of England Leicestershire and Rutland. p89-90. <2> Unpublished document: Sites and Monuments Record. Parish File. 60NW BF.